Fully Non magnetic weighted IV stand designed for use in the MR. Easily supports two Model 3850 MRidium MRI Smart Infusion Pumps. The Pole is 66″ high with a wide pole radius, 5 locking casters designed to roll easily during transport. Pole has four Aluminum hooks for holding fluids. Maximum recommended load is 20 kg. 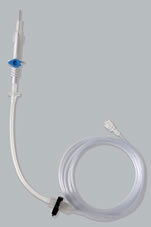 The MRidium Syringe Delivery set uses a unique vented syringe adapter which allows for delivery of IV Fluids from syringes in the MR Environment while on the 3850 MRidium MRI Smart Infusion Pump. This set is ideal for Paediatrics, Anaesthesia, and other modalities which call for small dose delivery through a syringe. The set uses Microbore Tubing along with integrated set and pump based free flow protection for maximum safety. The Syringe Set Priming volume is only 4mL, with an Overall length of 216cm (85″). The Administration IV Set is designed for starting a new IV line in the MR. The set is 118″ long, latex free, DEHP free, PVC tubing with a universal bag spike. It utilises two Needle Free Luer Locking Valve Sites designed for secondary and IV Push Delivery. Approximate priming volume is 18 ml. The set has built in integrated anti-free flow protection which can be used either as a gravity set or pump based set. It comes packaged in cases of 50 each. 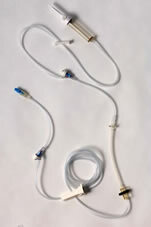 The MRidium IV Extension set is a uniquely designed infusion set which allows hospitals to deliver primary fluids by extending pre-existing non-MRI pump/infusion sets. Approximate priming volume is 10 ml.